We encourage you to view our NEW! MLS OPTIONS HERE. We show additional properties that are listed by other realtors as well as those listed below by Cheney Realty, Inc. Select up to three different criteria. Approx 310 acres of good farm property with lots of building sites to choose from. 75 acres is currently being farmed, producing about 70-80 bushels sub- irrigated. 2 wells on the property. Possibly one for domestic use and one for farming. (One well log shows 1200 GPM.) Great pasture that has produced 800+ lb calves at 8-9 months old. For more info contact Benji Estrellado at 509-990-9221, cheney@centurytel.net or Cheney Realty, Inc at 509-235-6191. Two ideal building sites in great location! 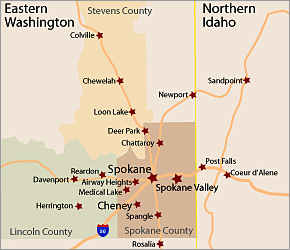 Central access to shopping, bus service, medical facilities, EWU and just mins to Spokane! Utilities in place with well, septic, power & phone in one parcel. Only power & phone at the line for the 2nd parcel. For more info contact Bev Heidecker at 509-990-1809, bev13@aol.com or Cheney Realty, Inc 509-235-6191. Rare and desirable R-2 lot one block from EWU and Sutton Park. Has a 1980 1,440 sq ft garage with a separate room and a 3/4 bathroom. Bring your tool belt and imagination! Has power, water & sewer hooked up to garage. Great views from atop this 20 acre parcel with a great mix of open and treed areas. Corner property stakes have recently been located and flagged by a licensed survey firm. Priced to sell! For more info contact Benji Estrellado at 509-990-9221, cheney@centurytel.net or Cheney Realty, Inc at 509-235-6191. A prime location with great building sites. Treed & surveyed 10.01 acres with views! Many lakes and high-end homes in the area. For more info contact Bev Heidecker at 509-990-1809, bev13@aol.com or Cheney Realty,Inc at 509-235-6191. Excellent rural location from this very usable level 20 acres. Easy access on well maintained road with lots of road frontage. Open and fenced with power at the line. For more info contact Bev Heidecker at 509-990-1809, bev13@aol.com or Cheney Realty, Inc at 509-235-6191. Great First St location in Cheney with lots of traffic for commercial opportunity! Level front and hillside back perfect for a daylight basement building or just utilize the main level.For more info contact Benji Estrellado at 509-990-9221, cheney@centurytel.net or Cheney Realty, Inc at 509-235-6191. Three Cheney lots in great location near Eastern Washington University and city parks. Just platted, all utilities are at the curb, new sidewalk, nice flat parcels make it easy to build. Nothing like them in Cheney! Seller will pay up to $7000 towards hook-up fees with full price offer. For more info contact Benji Estrellado at 509-990-9221, cheney@centurytel.net or Cheney Realty Inc at 509-235-6191.